Crystalline basement rocks, which comprise of crystalline igneous and metamorphic rocks of the Precambrian age are present across the area, but mainly in the upstream parts of the basin. 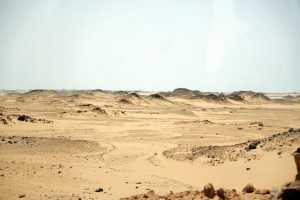 With the exception of metamorphic rocks the parent material is essentially impermeable, and productive aquifers occur where weathered overburden and extensive fracturing are present. The crystalline basement upper and middle catchment watercourses collectively considered as making up the Bahr el Ghazal system. The Muglad cretaceous rift basin underlies the very subdued topography of the Sudd and the lower reaches of the Bahr el Ghazal. Tertiary and Pleistocene sedimentary infill dominates the lower parts of the basin. Consolidated sedimentary rocks are highly variable and can comprise low permeability mudstone and shale, as well as more permeable sandstones, lime stones and dolomites, forming some of the most extensive and productive aquifers. Unconsolidated sedimentary aquifers are present in many river valleys. 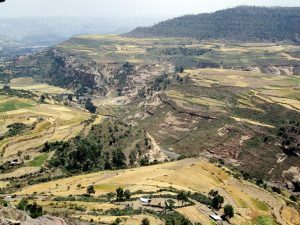 Volcanic rocks occupy the uplands (mainly the Ethiopian highlands), where they form highly variable, and usually highly important, productive aquifers.